Air tools are a wonderful thing, but getting a compressor where you need to work isn’t always so easy. 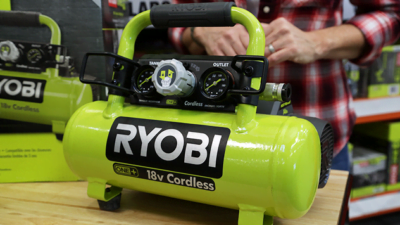 That’s why RYOBI created the 18-Volt ONE+ Cordless Portable Air Compressor. This compressor delivers cordless air at up to 120 PSI on the power of the same 18-volt battery that runs your cordless drill. That makes it perfect for inflating a tire or turning a pneumatic finish nailer into a cordless finish nailer. If you’re wondering about power, this thing can inflate a car tire from flat to full in 1 minute and 20 seconds, and it will inflate up to nine car tires per charge with their 4 Amp Hour Battery. It has the features you expect on larger compressors, like a universal push-to-connect quick coupler and a locking regulator to keep the pressure set at the intended PSI. Plus, there’s a metal air-hose wrap for onboard storage and a ¼-turn tank drain valve to drain the tank after use.